Definition: The preoperative phase is the time period between the decision to have surgery and the beginning of the surgical procedure. The preoperative phase can range from minutes to months. For a patient who has been diagnosed with a critical illness that must be corrected with surgery, the time from diagnosis to surgery may be measured in minutes. Those types of situations are usually caused by a traumatic injury or massive bleeding. For patients with a surgery planned in advance, the preoperative period may last for months. Some patients require extensive testing to determine whether they are able to tolerate the stresses of surgery and anesthesia. Others require "tuning up", a period of time where they work to improve their overall health under the care of the preoperative team. Preoperative testing can range from having a few blood tests to having a full cardiac workup to determine if the heart is working properly. Other patients may need treatment to improve their anemia, so that the blood loss associated with surgery is not harmful. In the hours before surgery, the surgical team will likely check in with you to make sure you haven't eaten anything since the night before, and to place IV access that will be used during surgery. You may have blood drawn and, if necessary, you may receive medications for your known health conditions or to relax you prior to the procedure. 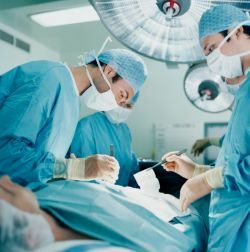 You will likely meet with your anesthesia provider, and perhaps your surgeon, prior to going to the OR. Any last minute questions can be answered and concerns addressed prior to having your procedure. Examples: Part of the preoperative planning is arranging to have a friend of family member drive you home from the hospital.